People nowadays carry a smartphone with them at all times. It is only during lessons that smartphones are still banned at many schools. How can digital media be used in the classroom such that more time is ultimately freed up for individual learner support and exchange? Although our everyday lives are dominated almost completely by digital media, institutional teaching has changed hardly at all as yet. Teachers still follow a “conventional” approach for the most part, using a variety of print materials to convey content to learners who may be paying attention to a greater or lesser extent. Although many teachers oppose the use of digital media, it is increasingly clear that this state of affairs cannot be maintained. While the digitization of teaching may be delayed in some cases by statements such as “All models and theories aimed at incorporating technology and media into teaching have so far failed”, or by demands that schools wait until all data privacy issues have been resolved once and for all before installing WiFi (Lankau 2016), it is a process that cannot be stopped. 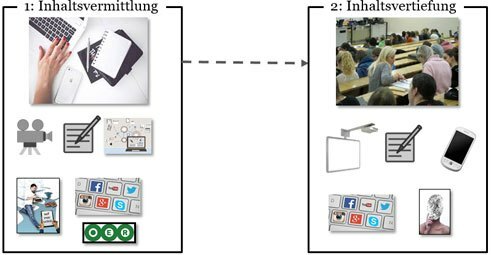 It is now obvious that supplementing the conventional teaching approach with digital content and using modern technologies in the lecture theatre or seminar room (Wannemacher et al. 2016) is not sufficient. Any such “enrichment model” changes conventional teaching only to a marginal extent, and results in less value being attached to classroom teaching. Now that many German universities no longer require students to be physically present, many students are justifiably asking why they should attend a particular lecture or seminar in person if the content can be found online. In other words, teachers need to do more than simply expand their conventional lessons with PDF documents, instructional videos or tablet PCs. It is only when teachers fully integrate digital components into their lessons that the desired effects – such as an enhancement of classroom activities or greater individualization – are achieved. A teaching model involving a shift in the central activities of teaching and learning illustrates how such integration can work: an entirely digital phase during which learners control the content learning process themselves is followed by a phase of more in-depth content engagement in teacher-guided classroom sessions. The basic premise of the Inverted Classroom Model (see Handke/Schäfer 2012: 94ff for a detailed description) is simple: learners work through the completely digitized content of a learning unit online, accessing a variety of digital elements – such as teaching videos, texts and other multimedia components – in the process. This means that the knowledge acquisition process is not tied to any particular time or place and gives rise to a level of learner autonomy that was simply not possible in conventional teaching environments with their rigid framework conditions: learners can choose between different learning materials, follow their own learning paths and determine the intensity of the learning process for themselves. This phase of digital content learning is followed by an entirely new type of classroom phase in which learners no longer have to acquire the knowledge but merely practise using it, thereby expanding their skills and proficiency in the subject. The fact that it is no longer necessary to teach content during the classroom phase gives rise to greater freedom, which teachers can use to focus on individual learners even in courses with large numbers of participants. For this kind of blended learning format to work in practice, a number of prerequisites must be met. For instance, the digital content in the first phase must be of sufficiently high quality and diverse enough to give learners individual opportunities to control the knowledge acquisition process themselves. Digital texts and mere recordings of lectures are far from adequate here. That said, the diversity and quality of the digital material is no guarantee that learners will be well-prepared when they come to the subsequent classroom phase. Mastery tests are conducted during the self-controlled learning phase in order to ascertain the knowledge level of the learners and, on this basis, to determine both the content and the structure of the classroom phase. In turn, these tests motivate learners to engage thoroughly with the digital content, and thus help ensure that they are adequately prepared for the classroom phase (Handke 2016). Accompanying the digital process of content learning with (mastery) tests in the interim is the novel feature of the Inverted Classroom Mastery Model that has been the standard model used at the Marburg English Studies/Linguistics Department since 2013. In addition, live voting in the classroom phase gives the teacher an idea of the extent to which learners are prepared. With the help of the Inverted Classroom Model, the conventional lecture theatre is turned into a cooperative place of learning in which mobile devices are indispensable aids, used for example for research or live voting. Another side effect of this is that it no longer makes sense to have students sitting in rows or a U shape as was the case in the past; instead, “learning islands” should be used that allow learners to communicate and collaborate with one another easily. The fact that we no longer have to convey content in the lecture theatre opens up enormous freedom and scope for us as teachers. In the highly “interactive” classroom setting, we can now turn our attention to individual learners and use targeted exercises to practise subject-specific and general skills; there are also new opportunities for digital collaboration. In this kind of classroom phase, the conventional role of the teacher is transformed in just the way that the American education expert Alison King already predicted back in 1993: “From Sage on the Stage, to Guide on the Side”, where the teacher simply accompanies the learners and has a permanent advisory role. Gradually, students are also seeing the benefits of this new classroom phase, with the result that they still come to lessons even though it is no longer compulsory, and absenteeism rates are low (Handke 2017). Testing has also changed because of the strong focus on skills in the classroom phase. In this model, pure knowledge tests – using for example multiple choice formats – now play a role only as electronic mastery tests in the learning process itself (cf. Fig. 2). By contrast, it is primarily proficiency that is checked in the electronic exams at the end of the course. Consequently, learners are also allowed to use the Internet during such exams, which is another way of respecting the reality of today’s everyday life. A properly functioning Inverted Classroom Model can hugely benefit particularly those subjects in which basic knowledge is combined with exercise phases. For example, students of linguistics who have completed the digital phase can intensively practise their phonetic or grammatical skills during the classroom phase. In addition, data can be analysed or theoretical approaches put to the test. This model is at least equally well-suited to language teaching: once content such as inflection patterns or word types has been taught, more time remains for individual practice in the classroom phases and, thanks to the opportunity for constant exchange with the learners, much more time for tailor-made support. Rather than conveying content, teachers quite simply have more time to devote to individual learners – the value of which can hardly be emphasized enough, particularly in language teaching. Handke, Jürgen (2013): Beyond a simple ICM. In: Handke, Jürgen/Kiesler, Natalie/Wiemeyer, Leonie (Ed. ): The Inverted Classroom Model. Conference volume for the 2nd ICM Conference in Marburg 2013. Munich: Oldenbourg Verlag, p. 15-22. Handke, Jürgen (2016): Die Wirksamkeit der Präsenzphase im Inverted Classroom. In: Großkurth, Eva Marie/Handke, Jürgen (Ed. ): Inverted Classroom and Beyond. Lehren und Lernen im 21. Jahrhundert. Marburg: Tectum Verlag, p. 27-40. Handke, Jürgen (2017): Nutzerverhalten im Inverted Classroom Mastery Modell. In: Handke, Jürgen/Zeaiter, Sabrina (Ed. ): Inverted Classroom and Beyond. Unpublished conference volume, Marburg. Hochschulforum Digitalisierung (2016): The Digital Turn. Hochschulbildung im Digitalen Zeitalter. Essen: Edition Stifterverband. Lankau, Rolf (2016): Digitalisierung und schulische Bildung. Wannemacher, Klaus/Jungermann, Imke/Scholz, Julia/Tercanli, Hacer/Villiez, Anna von (2016): Digitale Lernszenarien im Hochschulbereich. Berlin: Geschäftsstelle Hochschulforum Digitalisierung. Professor Jürgen Handke, a professor of English at Philipps-Universität Marburg, has written several books in the field of linguistics, language technology and e-education, and has been using digital teaching, learning and testing scenarios in higher education for years.